Do residents in your community have to travel to Disneyland to experience a distinctive main street? Do visitors need a road map to differentiate your town from the next? Public spaces are failing in many communities — and they are often barometers of vitality, social cohesion, and public health. 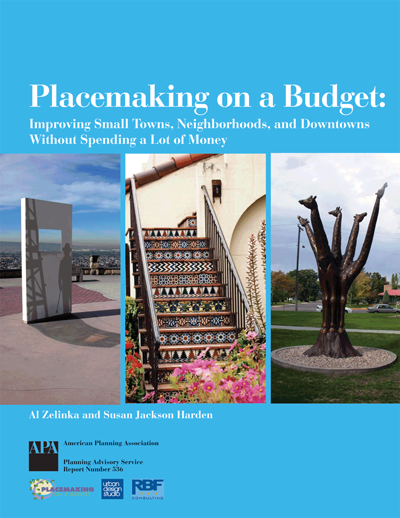 This report offers help for small towns, neighborhoods, and downtowns that need to enhance identity and social connections without spending a lot of money. Local characteristics, involved people, and creative thinking are the foundation of the strategies presented in the report, which can be used by public agency staff, public officials, or business and neighborhood leaders in any type of community. Find out how citizens can get involved in identifying the history, culture, and resources that make their community unique. Learn to recognize opportunities for expressing community values. Case studies show how communities across the country have successfully used the approaches described in the report. Some towns have transformed streetscapes to reflect their agricultural past. Other communities have used bus shelters and security gates as venues for public art. The report also catalogs resources available to implement placemaking projects and offers organizing techniques, useful worksheets, and tips on implementation.